One thing is for certain: Sony isn’t going to let trends in the Android world dictate how it designs its phones. Both the Xperia T LT30p (Xperia TL LT30at) and the Xperia TX LT29i are gorgeously designed, standing out from the competition — thanks to their curved backs, 13 MP shooters, and gorgeous displays. Both of these phones, however, also stand out for another reason. While a lot of competitors are producing quad-core beasts, these two Sony devices are equipped with dual-core processors. Does this mean that these phones have been left behind? The Xperia T is best known as the Bond phone, complete with a cameo appearance in Bond’s latest movie Skyfall, while the Xperia TX is a quieter but equally elegant device. How do these two attractive phones stand up against each other? Does the Bond phone have more muscle against the sleek Xperia TX? If you’re looking for a device that you can easily slip into your pocket, then look no further. Both of these phones are small enough to pocket while being a good size for your hand. The Xperia TX is taller and slightly wider than the Xperia T but it’s also thinner and lighter. The Xperia T’s thickness and weight makes it feel solid, while the Xperia TX’s thinner body makes it feel elegant. Next to the Xperia T, the Xperia TX feels a bit fragile, almost cheap. But, don’t judge a phone by its slimness. Grip both of these phones in one hand and you won’t hear any creaking. The Xperia T and the Xperia TX do not have physical navigation buttons. Navigation is done purely through the buttons onscreen. On the top bezel of both phones, you can find the notification light, light sensor, phone speaker grille, and 1.3-MP front camera surrounding the silver Sony wordmark. There are, however, a few differences. The notification light on the Xperia TX is located on the right side and is bigger and brighter compared to the Xperia T’s smaller and subtler notification light on the left side of the Sony wordmark. The Xperia T’s phone speaker is located right above the Sony wordmark, compared to the Xperia TX’s own phone speaker which is against the frame surrounding the front. The Xperia T’s phone speaker is also deeper, which may attract particles to accumulate. The silver Xperia wordmarks decorate the bottom bezel on both phones, but unlike in the Xperia T, the Xperia TX’s wordmark lights up when the phone is unlocked. Both the Xperia T and the Xperia TX’s jet black fronts are surrounded by a plastic frame, jet black on the Xperia T and white on the Xperia TX. It’s a lot subtler on the Xperia T, but with the Xperia TX, it’s a cool visual effect. A thin silver stripe runs around the Xperia TX’s edges, while the Xperia T’s own sides are where the hard plastic of its front meets the soft rubber material of its back. Both the Xperia T and the Xperia TX want you to use them as music players, as their 3.5 mm headphone jacks are conveniently located on their top sides. The Xperia TX’s headphone jack, however, looks more attractive compared to the Xperia T’s which breaks the nice curved edge at the top of the device. Also located at the Xperia T’s top side is a hole for a microphone. The Xperia T’s left side contains only the Micro USB port, while the Xperia TX’s own left side has the Power button and at the lower portion, a place to hang phone accessories and for removing the Xperia TX’s backplate. I consider the position of the Xperia T’s Micro USB port to be a good move, as it is less likely to be covered up by fingers when using the phone. The Xperia TX’s right side holds its Micro USB port, Volume Rocker, and the dedicated Shutter button. I wasn’t very fond of the location of the Xperia TX’s Micro USB port, as it has a tendency to be covered by the user’s thumb and may be a good place for dust and grime to gather. The Xperia T’s own right side is a lot busier; at the top portion, you’ll find the cutaway flap covering the microSD and micro-SIM card slots, below that is the Volume Rocker, and finally the Shutter button. Both the Xperia T and the Xperia TX have only a microphone on their bottom sides. When I first picked up the Xperia T, I found its hardware button placement to be strange. It’s a bit lower than usual on the phone and the buttons are a little hard to reach if I don’t hold the Xperia T by its lower portion. The Xperia TX’s buttons, on the other hand, are much easier to access as they’re at the usual height. Both the Xperia T and the Xperia TX inherited the curved back of previous Xperia phones such as the Xperia Arc and Xperia J. Both of these phones’ left and right sides curve inward, allowing the phones to snuggly fit in the hand. The Xperia TX’s back is more curved than the Xperia T’s, but this also gives the Xperia TX a tendency to see-saw when you use it on its back. Both phones’ rear elements are all arranged along their back covers’ center. There’s the 13-MP camera, which juts out slightly, the LED flash, the NFC certification sticker, the Xperia logo, and the loudspeaker grille. On the Xperia TX, however, right below the NFC certificaion sticker, is a small hole for the recording microphone. The Xperia T’s back is covered in a soft touch rubber material while the Xperia TX’s own back is covered by textured plastic with a pearl-like shine to it. Though the Xperia T’s back feels comfortable to hold, the Xperia TX’s back looks more sophisticated. The Xperia TX’s back cover can be removed, allowing users to replace the device’s battery and access the microSD and micro SIM slots. Watching HD videos is a great experience on both phones. Both the Xperia T and the Xperia TX have gorgeous displays, enhanced with Sony’s Mobile BRAVIA Engine, but next to each other, the colors they produce are different. The Xperia T’s screen gives off very bright colors, while the Xperia TX’s own colors are slightly darker, slightly yellow, and more saturated. This makes the Xperia TX’s colors look more natural compared to the overly bright colors of the Xperia T. The Xperia T’s dark tones, especially when displaying videos, are also rather noisy. For watching movies and videos and viewing pictures, I prefer the Xperia TX’s screen because it provides me with richer and more vivid colors. Despite owning dual-core processors when many competing devices are carrying quad-core muscle power, the Xperia T and the Xperia TX performed well when I launched apps and when I scrolled through the homescreens and the app drawer. They performed the same tasks at nearly the same time, with only split seconds between them. The Xperia T, however, was slightly faster in loading web pages and was more responsive to my pinching in and out. It’s worth noting that the Sony white paper for the Xperia TX declares it to have an Adreno 220 GPU, but AnTuTu says it is an Adreno 225 GPU. Though benchmark tests do not produce the same results, in our set of scores, the Xperia TX seems to provide more muscle than the Xperia T.
These two phones are NFC-capable, though no NFC tags came in the box. You can also connect to other devices and accessories via Bluetooth. To transfer data to and from these devices, as well as to charge them, you can plug in a cable into the phones’ Micro USB port. Both the Xperia T and the Xperia TX are DLNA-certified, allowing you to view your videos and movies on large screens thanks to their “Throw” feature. To use their phone capabilities, both phones require a micro-SIM. The micro-SIM slot on the Xperia T is covered by the cutaway flap on the device’s right side, while the Xperia TX’s micro-SIM slot is located underneath the back cover and can only be accessed by removing the battery first. Neither of these phones are LTE capable, however the Xperia T’s AT&T variant, the Xperia TL LT30at, supports LTE. Both the Xperia T and the Xperia TX are equipped with 13 MP rear cameras with Sony Exmor R sensors and 1.3 MP front cameras. I took a couple of shots outdoors, under direct sunlight. Though the Xperia T and Xperia TX’s rear cameras produced nearly identical pictures, the Xperia T’s camera picked up richer colors and had higher contrast. In this shot, taken in broad daylight, the Xperia TX’s camera produced a yellowish image. Indoors, the Xperia T’s camera took longer to focus on the subject. Despite this, the Xperia T performed well and captured crisper images than the Xperia T. The Xperia TX continued to take yellowish images, even out of direct sunlight. Turning on the flash for indoor pictures resulted in a foggy and very yellowish picture from the Xperia TX. The Xperia T’s own flash was also slightly yellow, but it helped produced crisper and more natural-looking pictures. Night mode on the Xperia TX activates the flash, which washes out the subject, but the Xperia T’s own night mode looks more natural. The Xperia TX’s front camera produced noisier images indoors. Outdoors, the Xperia T’s front camera captured crisper colors. Both the Xperia T and the Xperia TX are capable of 1080p Full HD recording, with image stabilization. Unfortunately, image stabilization is poor, though the Xperia T at least produces clips with vivid and vibrant colors. Both the Xperia T and the Xperia TX are equipped with Sony’s WALKMAN music app, which lets users customize their listening experience using equalizer presets, a 5-band equalizer, and Clear BASS. Both phones also come with xLoud to really make that loudspeaker loud. I played the same music tracks the phones came with and noticed that the Xperia T provides louder and clearer sound. When you turn up the volume on the Xperia TX, you’ll hear unpleasant distortion. The Xperia T, however, is a bit disappointing when watching videos. Though both phones have no trouble playing 1080p Full HD videos, the Xperia T’s noise reduction seems so aggressive that dark tones look noisier and unattractive instead. In the Amazing Spiderman’s trailer, for example, the city lights looked terrible against the black of the night. 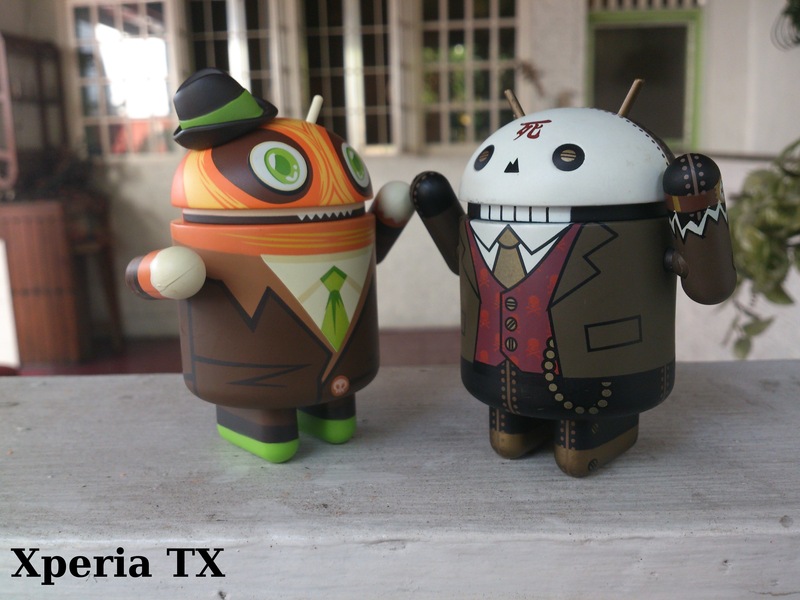 The Xperia TX may not give you as much contrast but it does, however, make dark tones look better. The Xperia TX may pack a lower-rated battery, but the same battery has the benefit of being removed and replaced — handy for users on the go and who prefer carrying extra batteries. The Xperia T, on the other hand, has a unibody design which prevents this. To put these two phones to the test, I subjected them to an informal battery test. This consists of turning on Wi-Fi, Bluetooth, NFC, and syncing options. I also turned Volume and Brightness up to their highest settings. Both phones’ screens were not allowed even a moment’s rest. The first part of the test involved playing a video on loop for one hour. The second part of the test involved browsing a graphics-heavy website for another hour. After two hours of our battery test, the Xperia T walked away with 51% of its battery left. The Xperia TX, however, did not do bad at 49%. If you’re a heavy user, you’ll need to bring your charger for both phones, but with conservative use, these phones may have enough battery power to last you the day. During our camera test, I noticed that both phones became quite warm, but the Xperia T was warmer. This may be because of its unibody design. The Xperia T’s vibration motor also seems to rattle more than the Xperia TX’s. It may not bother some people, but I found this rather unappealing. Nowadays, devices are expected to come out of the box with Android 4.1 Jelly Bean, but the Xperia T and the Xperia TX come with only Android 4.0.4 Ice Cream Sandwich with Sony’s Timescape UI. Sony has promised, however, to deliver a Jelly Bean update in February, 2013. Both of these phones’ interfaces are similar. Their lockscreens feature only an icon for unlocking the phone and another for launching the camera app. Both phones each have 5 homescreens to utilize and a notification menu that you can pull down from the status bar. Their App Drawers are arranged in 5×4 grids, allowing you to uninstall apps directly from the App Drawer and a number of ways to arrange your apps. You can tweak the keyboard layouts, add additional buttons, and add your own personal jargon to the Personal Dictionary. Voice typing is available on both devices, but you’ll need the Internet to use it. Both of these phones have gesture typing as well, which I prefer over the stock Xperia keyboard that’s too small for my thumb. Both the Xperia T and the Xperia TX also come with Sony’s Small Apps, which you can use while doing other things on your phone. You can use a calculator, timer, notepad, and voice recorder on both of them. Searching on these devices lets you not only look at results on the web, but also content available locally. The security features that the Xperia T and the Xperia TX come with are standard Android ones, such as Slide, Face Unlock, Pattern, PIN, and Password. One of the main differences between the two is that the Xperia T allows you to pull down your notification menu while the phone is locked. This means being able to check your notifications on the go, but I personally prefer the privacy that the Xperia TX gives you. The Xperia T also comes with Music Unlimited and Video Unlimited apps pre-installed, as well as Play Books and Play Music. The Xperia T is available in black, silver, and white but with only a 16 GB storage model. It is available for 399 pounds (about US$642) in the U.K. Clove is offering it SIM-free, with a free 60 day Music Unlimited Premium trial, for 378 pounds (US$612.21) including VAT. Unlocked Mobiles is offering the Xperia T for 374.98 pounds (US$607.32) including VAT. If you’re based in Canada, you can get the Xperia T for anywhere between CA$525 to CA$550. Bell Canada is offering the Xperia T, SIM-free, for about CA$549.99. The Xperia T’s LTE variant can be purchased from AT&T as the Xperia TL LT30at with a 2-year US$99.99 contract. The Sony Xperia TX comes in black, pink, and white will cost between US$545 – US$635 (Rs 30,000 – 35,000) in India, a price tag of about US$606 (HK$4,698) in Hong Kong and about $680 in China. The Xperia T LT30p (Xperia TL LT30at) and the Xperia TX LT29i are two of Sony’s most gorgeous devices, equipped with gorgeous displays, 13-MP cameras, and curved backs. Equipped with dual-core processors, these phones may seem to have been left behind by the quad-core competition, but they can still provide a snappy experience for users. The Xperia T’s display produces bright but sometimes washed out colors while the Xperia TX’s own display gives viewers more natural and more saturated colors. For music listening, however, the Xperia T is louder and provides crisper sound. The Xperia T’s camera also captures crisper and more vibrant colors compared to the slightly yellowish look of the Xperia TX’s images. Neither of these phones, however, are ideal for video capture as their image stabilization features still produce jittery clips. Which one of these devices did you like most? Let us know in a comment or vote in the poll below.